Black is usually never seen in a positive light, but there are so many perks to this envelope that we can't see why you would ever be afraid of it! Let your mail get the consideration that it deserves. In contrast with all the ordinary mail that’s delivered, the shiny black exterior of Black Foil Envelopes stands out and gets attention. 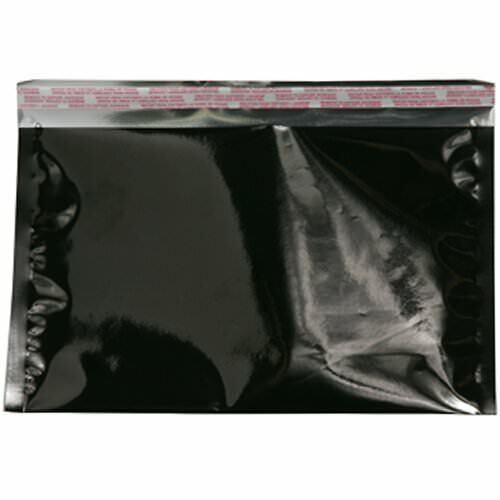 What’s more, these Foil Envelopes are built to withstand tough circumstances. They’re made of heavy-duty plastic foil, making them water resistant as well as tear-proof. Use these envelopes to ensure that your packages arrive in the same condition with which they were sent. You’ll also cut down on time due to the self sealing peel and seal closure. Send more out in less time. Mail your important materials out with confidence.